Finca Santa Rita lies high among the clouds in Sosonate, near the town of Juayúa in El Salvador, due west of El Salvador’s Santa Ana Volcano. The farm’s vista overlooks a rich valley, and Maurcio Escalon, the farm’s owner, takes great care to preserve the farm’s natural beauty as well as make the most of its privileged natural location for coffee production. Mauricio, who is a landscape architect by training, is also a 5th generation coffee farmer and knows that ‘traditional’ methods can often give farmers and advantage if used wisely. He uses biological controls wherever possible, eschewing the use of chemical pesticides and fertilisers where he can. He uses natural bacteria (tricoderma) and fungus to manage soil diseases and promote root health, and foliage issues are managed primarily by pruning and renovation. Santa Rita is planted out with a mix of Bourbon, and Pacas varieties. This ‘El Aguacate’ microlot – so named for the large avocado trees that stand on the plot where the coffee is picked – is made up of 100% Pacas. On average, Mauricio maintains approximately 2,899 coffee trees per hectare at Santa Rita with good spacing between rows. This density of planting means that plants don’t over-compete for scarce resources and that air continues to circulate between the plants, ensuring their optimal health. 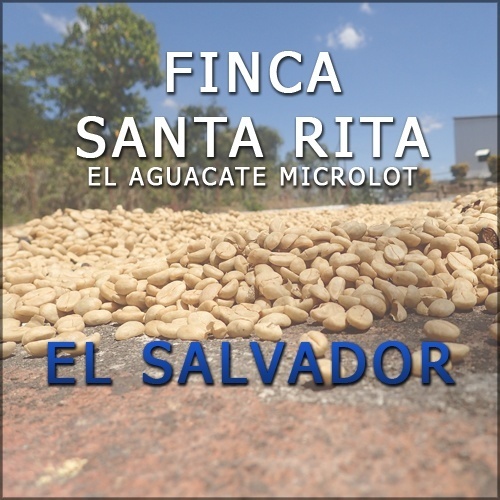 All the coffee from Santa Rita (along with Mauricio’s other farms) are processed at Mauricio’s nearby Cafescal Mill, in San Jose. The small beneficio is meticulously run and produces coffees using a wide range of processes. During the harvest, Santa Rita’s cherries are delivered to the mill to be pulped on the same day. After fermentation and washing, the coffee is spread to be sun dried on clay patios, where they are moved every 30 minutes or so – receiving up to 16 rakings in a day. After the 4th day of drying, the coffee is compiled again for the evening. Then it is spread again, where it is moved a full 16 times a day until it achieves the optimal humidity for storage.